The three drives pattern is a reversal pattern characterised by a series of higher highs or lower lows that complete at a 127% or 161.8% Fibonacci extension. It can signal that the market is exhausted in its current move and a possible reversal is about to occur on the price chart. The bullish version of the pattern can help to identify possible buy opportunities and the bearish version can help to identify possible sell opportunities. 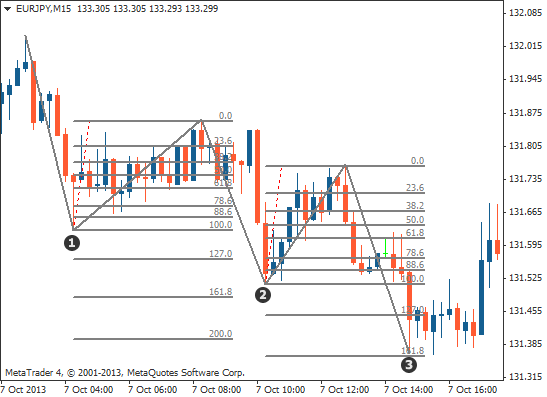 The three drives pattern is a reversal pattern characterised by a series of higher highs or lower lows. It has a bullish version and a bearish version. 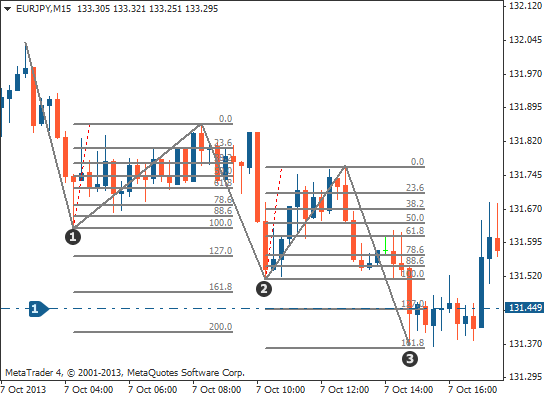 As you can see above, the price makes an initial low at point 1, this is the first drive of the pattern. Price then retraces before making a new low at point 2, forming the second drive. This second low should be a 127% or 161.8% Fibonacci extension of the first drive. The price then retraces once again and makes a third drive down which should also be a 127% or 161.8% Fibonacci extension of drive two. It is this third drive that you want to pay the most attention to as this is where you are looking for a long entry. This time the price makes an initial high at point 1, this is the first drive of the pattern. Price then retraces before making a new high at point 2, forming the second drive. This second high should also be a 127% or 161.8% Fibonacci extension of the first drive. The price then retraces once again and makes a third drive up which should also be a 127% or 161.8% Fibonacci extension of drive two. It is this third drive that you want to pay the most attention to as this is where you are looking for a short entry. We will now show you how to trade the three drives pattern. 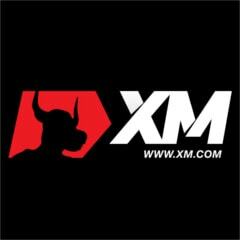 Traders look to enter the market on the third drive as this offers the most precise entry point with the greatest profit potential. This will either be a 127% or 161.8% Fibonacci extension. 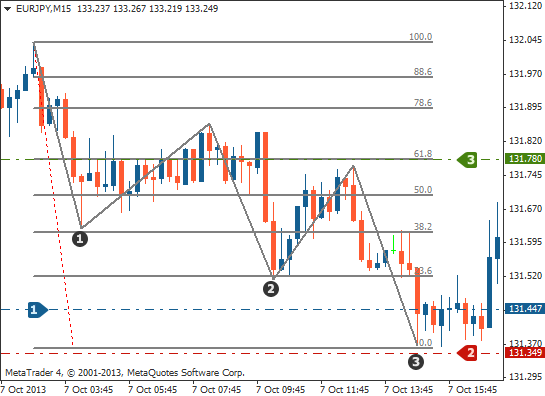 We will use the bullish three drives pattern as an example. For a bearish three drives pattern (a short/sell trade), simply invert the pattern and your orders. As you can see, the price hits the extension level on the third drive down which is where the entry for the buy trade is placed, in the opposite direction to the most recent overall move. Place your stop loss below the 161.8% Fibonacci extension level of the second drive. A simple way of finding a profit target is by drawing a Fibonacci retracement from the very high of the start of the pattern to the very low of the pattern, where the pattern completes the third drive. The take profit is the 61.8% Fibonacci level of this swing. … the three drives pattern is a reversal pattern designed to highlight times when the market is exhausted in its current move. … the pattern has a bullish version and a bearish version. 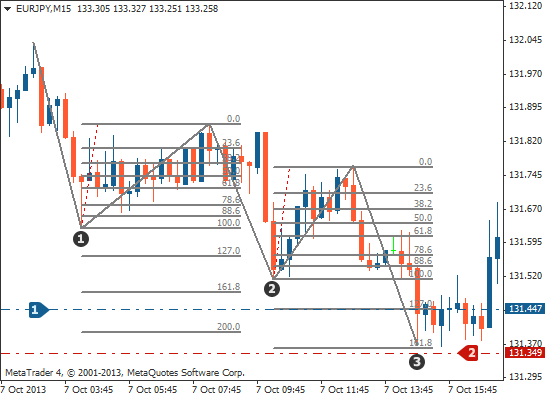 … the pattern is composed of three waves or drives that complete at a 127% or 161.8% Fibonacci extension. … the trade is entered in the opposite direction to the overall move, when the third drive is completed at a 127% or 161.8% Fibonacci extension. 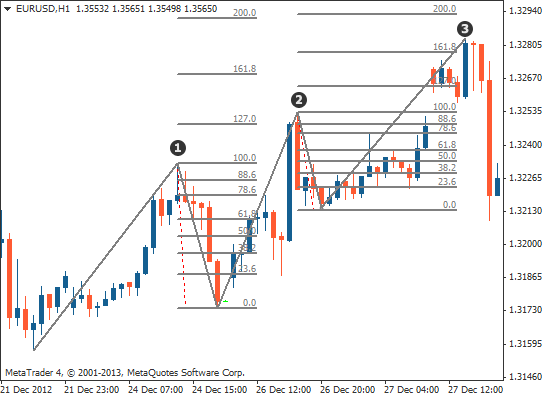 … the stop loss goes below the 161.8% Fibonacci extension for a buy and above the 161.8% Fibonacci extension for a sell. … draw a new Fibonacci retracement from the start of the pattern to the completion point of the pattern and take profit at the point where price will have retraced 61.8% of that distance.